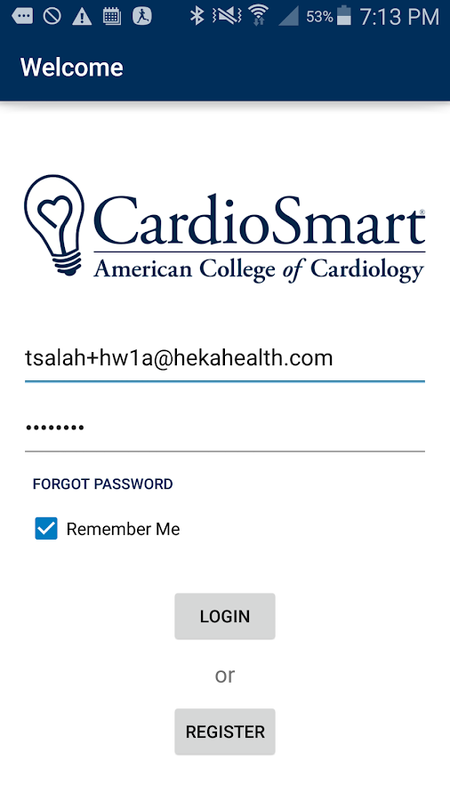 App supporting the American College Of Cardiology's CardioSmartWalking Challenge. The next Challenge will be launching at ACC.18on March 10, 2018 in Orlando and has been graciously supported byActelion. The Challenge encourages participants to engage inhealthy activities, some friendly competition, and win prizes. TheACC CardioSmart team will be giving out free Bluetooth connectedstep trackers to the first 100 participants that come to theWalking Challenge booth located in the Hall C lobby of the OrlandoConvention Center. The app also supports step data from Fitbit,Jawbone, Garmin, and step data from Android smart phones withintegrated step trackers. App supporting custom Walking Challenge programs at selectconferences/events, employer wellness programs, and on-goingvirtual Challenge campaigns. Walking Challenges encourage eventattendees to engage in some friendly competition, meet new peopleand have some fun! It additionally provides Challenge sponsors withprominent brand visibility and deep engagement with their targetaudiences including the ability to drive specific brand objectives(e.g., event booth traffic). Participants may be providedcustom-branded Bluetooth connected Activity Trackers to track thenumber of steps they take during a Challenge. The app also supportsstep data from Fitbit, Garmin, Apple Watch, and, via ourintegration with Apple Health and Google Fit, the step data trackedby your smart phone or tablet. App supporting the American Diabetes Association's third annualWalking Challenge, supported by AstraZeneca. The Walking Challengewill be held during the ADA's 77th Scientific Sessions held June 9- 13, 2017 in San Diego, CA.The Challenge will encourage Sessionattendees to “walk the walk” and engage in some friendlycompetition. The ADA will be providing ADA-branded Bluetoothconnected Activity Trackers to the first 1,200 Walking Challengeparticipants. These trackers will track the number of steps youtake during Sessions and then wirelessly send that data to a customADA Challenge app on your iOS device. The top 25 individualsteppers and total number of cumulative participant steps will bedisplayed on plasmas screens at select convention site locationsincluding AstraZeneca’s exhibitor booth (#1135). The ADA challengesall attendees, and those participating in the challenge to take77,000 steps over the days of the event to commemorate our 77 yearsof service to those affected by diabetes. App supporting the American Thoracic Society's Walking Challenge atATS 2018 sponsored by Teva Respiratory. The Challenge startsSaturday May 19 at noon PT and ends Tuesday May 22 at midnightPT.Walk for a good cause! For every participant who walks 30,000steps during the Challenge, Teva Respiratory will make a donationof $100 to the ATS Foundation, for a total maximum donation of$50,000. Remember - 100% of all donations to the ATS Foundationfund new research awards. FREE ATS Wireless Activity Trackers aregiven to the first 2,000 registrants that stop by the WalkingChallenge booth, located across from the Starbucks in Lobby B,starting Friday, May 18 at 8:00 am PT. The ATS Walking ChallengeMobile App also supports attendees who prefer to use their ownFitBit, Jawbone, Garmin, Apple Watch, or iPhone/Android smart phonestep counters. Android app supporting the AARP's WalkingChallenge. The Challenge will encourage AARP members to get activeand engage in some friendly competition. Participants will beprovided with AARP-branded Bluetooth connected Activity Trackers orcan alternatively use data directly from their smart device's stepsensor or their own Fitbit or Jawbone devices.The first AARP Walking Challenge will be launched at the 16thLibrary of Congress National Book Festival in Washington DC onSeptember 24, 2016. App supporting the PCMA's 2018 Walking Challenge sponsored byDestination Cleveland. The Challenge will encourage PCMA members toget active and engage in some friendly competition. The app alsosupports step data from Fitbit, Jawbone, Garmin, and, via ourintegration with the Apple Health App, step data from Apple Watch,Withings, and any dedicated step tracker hardware integrated intoyour Android phone. The American Heart Association (AHA)'s BP Tracker is an integralcomponent of the SPONSORED version of AHA's Check. Change. Control. (CCC) High Blood Pressure Management program that is currentlyrunning in the AHA's Southwest and Tampa Bay markets. Through acombination of remote BP monitoring and health mentoring, theevidence-based CCC program has shown proven results in helpingpeople manage risk factors that lead to cardiovascular disease andstroke. Please note that the app requires an activation codeprovided by your local community AHA representative to enroll. Ifyou are not part of the AHA's Southwest and Tampa Bay CCC programs,you can still register using SWTEST as the activation code. The AHABP Tracker receives and displays diastolic and systolic bloodpressure measurements, as well as heart rate data, from A&DMedical's family of wireless blood pressure monitors includingtheir multi-user BP kiosks (for use in clinics, community centers,offices, etc.) and personal BP monitors (for at home, on-the-go,and remote patient monitoring). The AHA BP Tracker is powered byHeka Health's HIPAA compliant, HITRUST certified, Connected HealthSAAS Platform. Please contact us at [email protected] for moreinformation. App supporting the National Lipid Association's 2018 Step Challengegraciously sponsored by Kowa. The Challenge will encourage NLAmembers to engage in healthy activities, some friendly competition,and win prizes. Participants can use the "NLA Red" Bluetoothconnected Activity Trackers distributed at the NLA 2018 AnnualScientific Sessions or can alternatively use data directly fromtheir smart device's step sensor (directly or via Google Fit) ortheir own Fitbit, Garmin, or Jawbone devices. Measure all your sports, track your progress from one session tothe next, and find the right training session to fit your goals:starting to run or getting back on track, losing weight and keepingfit, gearing up for a race. TRACK YOUR SPORTS SESSIONS IN REAL TIMEDecathlon Coach is a multi-sport mobile application to measure yourspeed, distance covered, calories burned, difference in altitudeetc. Configure the values you want to monitor on your screen or inyour earbud using the audio feature, in real time. Then get a moredetailed analysis on the website www.decathloncoach.com: -Superimpose your sessions to assess your progress - Analyse themost telling parts of your circuit, - View your progress over themonths and years with our tracking charts ... TRAINING PLANSTAILORED TO YOUR RUNNING GOALS You want to start running (again)?Over 4 to 6 weeks, starting with 30-minute sessions alternatingwalking and running, find your pace to run for 45/50 min withoutstopping! DECATHLON COACH can also suggest 6-week plans for thosewanting to shed a few kilos or simply keep fit, at a rate of 3sessions a week. Are you planning to take part in a race with noidea how to gear up? Follow Philippe Propage, international trainerand Kalenji coach, over 8 weeks to reach the finishing line withouta hitch! BOOST YOUR PERFORMANCE: Follow the coach or exercise byyourself! Interval training involves alternating fast spurts andgentler phases in the same session. This type of training helps yourun faster, including during endurance runs. Philippe Propagesuggests exercises and gives running tips. The application providesaudio encouragement as you exercise. Would you like to include yourown exercises? You can do this too, by entering them manually. Youget to customise your sessions to a T. SPORT AT YOUR OWN PACE It'simportant to measure your heart rate for insights into the effortyou are putting in and to progress safely. The cardio gaugeexplains the benefits of your effort at any given time: Blue =warm-up, Green = Endurance, Orange: Resistance, etc. STAY INCONTACT WITH YOUR FRIENDS AND GET MOTIVATED WITH THE COMMUNITY Areyou proud of your session? Quite right too! Decathlon Coach letsyou share your session AND compare it with your friends with thepodium available among friends. Lastly, you can share your positionin real time with friends and family so you can be safe at alltimes. They can see exactly where you are via a secure web page. Track your pace, measure workout distance, count burned calories,crush training goals and more with the Zeopoxa Running &Jogging app. Stay on track, no matter where you are, on the trailor streets. Whatever your goal, be it to lose weight, shape andtone, build strength, get faster or improve endurance or justjogging or running, this fitness app will help you achieve yourgoals faster. With this app, you can track all of your workoutsusing GPS, check your stats, and reach your goals. Longer distancescovered equals more calories burned, too! Take your first steptoday, download the free Zeopoxa Jogging & Running app on yourphone and push yourself to a fitter and healthier lifestyle. On topof being a run tracker and fitness tracker, this app provides youwith many more features to improve your fitness and ensure you’reenjoying your workout. APP FEATURES & BENEFITS: * Map workoutsin real-time with GPS & monitor exercise progress * Calculateroute distance, duration, speed and calorie burn for your runningand jogging activity - in high accuracy and real time * No lockedfeatures, all features are 100% FREE. You can use all featureswithout having to pay for them. * Small size (below 5MB) * Fast,light and user-friendly app * See your time, distance, caloriesburned, average speed, max speed, average pace, elevation gain,graphs with speed and elevation and map with route you run, in theworkout summary * Advanced statistics with graphs in 4 differentintervals (week, month, year and all) * This app allows you to seta goal that's right for you (number of burned calories, distancetraveled or running time during the day) and get notification whenthey accomplish * No wristband or other hardware required, nowebsite login, just download for free and start tracking yourexercise right away. This app works entirely from your phone *Complete challenges that app provide and stay motivated * Keeptrack of your personal records in the Zeopoxa running & joggingapp * Calculate your BMI with built in BMI Calculator * History ofall recorded workouts. * Voice feedback letting you know yourprogress as you run. A motivating voice that you can customize torelay your speed, pace, distance, time and calories burned, alsocustomizable per distance / time * Insert workout results manually.Ready to let this app be your run tracker, jogging tracker andfitness tracker? Stay fit - track value of distance, average speed, burned calories,steps (pedometer) and much more during running, cycling, walking,rollerskating and other sports and fitness activities. Lose bodyfat and improve cardiorespiratory fitness with Caynax GPS SportsTracker. ✔ Fast, light and user-friendly app. ✔ No registrationneeded. ✔ Small size (below 10MB). ✔ Supports over 30 languages ✔All for free. Main features: - Application uses Android deviceGPS(BEIDOU, GLONASS) to track your activity. - Track your progresslive on map (Google Maps or OpenStreetMap). - Record the activityroute. - Use TTS (Text To Speech) to get voice information aboutworkout duration, distance, speed, burned calories, pace and more.- Auto pause - app will automatically pause when you are notmoving. - Set workout goals (time or distance) to improve yourstamina. - Use dark view in the evening or during strong sunexposure - Share your activities on social networks (Facebook,Google+ etc.) - Browse workouts history (+ store application dataon GoogleDrive). - Monitor your workouts statistics - compare yourresults in daily, weekly and monthly intervals. - Customize workoutdashboard to display information most important to you. - Addactivities to schedule to create reminders (notification). - Metric(meters, kilometers) and imperial (miles, yards) units support -Android Wear support - Import/export workout to GPX and TCX formatAvailable indicators: Speed, Distance, Calories, Altitude,Duration, Steps, Pace, Movement Time, Average Speed, Average Pace,Maximum Altitude, Maximum Speed, Maximum Pace. Available sports andfitness activities: Cycling (Bike/Bicycle Ride), Running (Jogging),Walking, Hiking, Swimming, Nordic Walking, Cross country skiing,Kayaking, Rollerskating, Rowing, Skateboarding, Skating, Snowskiing downhill, Snowboarding, Snowshoeing, Walking upstairs,Wheelchair, Motorbiking, Scooter, Mountain biking, Stand UpPaddling (SUP). Application contains in-app advertisements. Reach your walking goals using free Walking Step Counter PedometerCalorie & Fitness Tracker Pedometer app. With its simple anduser friendly UI this app will become an ideal fitness companionfor you. This Walking for Weight Loss & Step Counter Calorie& Fitness Tracker Pedometer app is your walking companion thatwill record all the details of your activities, letting you enjoyyour outdoor experience . This app will let you record your walkingroutes and save them for the later review and analysis. Mainfeatures of the app are following: *Step count ( Pedometer )*Switch between metric and imperial units *Current walking speedbased on GPS reciever *Total duration of the activity *Altitudeprovided by GPS *Walking distance *Average walking speed *Googlemaps *Tracking your walking route *Saving your activities *ExportGPX and KML of your activities *Calorie count . With its simpleinterface Walking for Weight Loss and Step Counter Fitness Trackerapp will provide the best experience for your fitness and otheroutdoor activities. You can track the amount of calories burned theapp will also provide you with the data like distance , totalduration of the activity , step count ( pedometer ) and etc.. ThisWalking for Weight Loss and Step Counter Fitness Tracker app canalso be useful in hiking , running , backpacking and in otheroutdoor activities. * We do not use altitude (due to its extremeinaccuracy) in calorie count. Walking Odometer Pro is a GPS fitness app for walking and hikingdesigned for outdoor use. Take it for a walk or run and it willaccurately record your route, distance traveled, energy expended incalories or kJ, elevation changes, and more. Unlike a steppedometer, Walking Odometer Pro leverages the power of GPS, and bydoing so, is able to provide more accurate measurements fordistance walked and calories burned than can be achieved with asimple step counting pedometer. Set long term or short term goalsfor yourself to motivate you to walk or run to a better fitnesslevel. Choose a calorie goal, distance goal or decide how manypounds or kilograms of fat you would like to lose, then view yourprogress during and after your exercises. The application has apowerful data manager that allows you to sort and view youraccomplishments by day, month, week or year. Or, view speed,altitude and distance profiles for any given recording. The app iseasy to use. Simply press the start button, close the app and beginyour activity. The application's odometer is internally calibratedso there is no need for you to go through a lengthy trial-and-errorcalibration method. If you need to interrupt your walk, you canpause an activity and resume it at a later point in time. Pausesand resumes are reflected on the trail map which will clearly showsplit distances and other stats. There is a one-of-a-kind odometeron the first screen that shows your distance. The meter was modeledafter the rolling drum odometers seen in old cars and functions thesame way -- the display actually rolls in real time as you walk /run. The route maps include navigation features that will allow youretrace your footsteps if you happen to get lost while walking innew and unfamiliar areas. Other features include: 👣 Link your walksto Google Earth with a single tap (new June, 2018). 👣 Voicemessages will be called out to you indicating your distance every1/4 km or 1/4 mile and at every 10 minute mark. 👣 Lock-protectedactivity control panel prevents accidental termination of arecording. 👣 Secure your data by backing it up regularly. Ourbackup and restore utility does not require any purchase or accountactivation. Backup / Export your accomplishments as kml, gpx andcsv files. View exported data in Google Earth and other kml/gpxready apps such as GPS Waypoints Navigator. CSV files can be viewedin spreadsheet format by Google Docs, Open Office Calc, MS Excel. 👣All your data can be imported back into the app from your exportedkml and gpx files should you need to replace your device. 👣 Nospecial accounts are required. Download and start using the appimmediately. 👣 Analog and digital odometers for running or walking.👣 Calorie counter, chronometer and stop watch. 👣 Heading andaltimeter readings with max / min altitude. 👣 Speedometer. 👣 Setcalorie, kJ, distance and exercise duration goals. 👣 Many ways toview your accomplishments. Reports include summary and detailedcharts, maps and graphs. * Walking Odometer Pro is a free app withno hidden fees and no subscriptions. The free version limits thenumber of walks that can be stored at a time to 15 with the abilityto replace and delete saved walks, so there is virtually no limiton the number of walks you can record. A small one time upgrade feecan be made if you would like to store more than 15 walks. Downloadme today and let me be your new running or walking partner! 👣 This is an effective pedometer app to track your daily steps andhealth life. A health app to help you track distance you walking,steps counting, calorie you burn and your weight. All theinformation will be visually displayed in graphs. 🌟Every stepcounts. Just enter our app and start your daily steps or activityplan, then it starts steps tracking automatically. It canauto-record your steps when your phone is with you, even yourscreen is locked or your phone isn’t in your hands. This stepcounter tracks your steps and calorie you burn accurately, whichhelps you be more physically active. It can help you keep fit andget a more active life. 🔥Highlight Features for steps tracker: ⏰Real-time Step Counter ➤Record your fitness activity（number ofsteps, distance, calorie, weight, speed etc.）Built-in pedometertracks your steps as you walk every day. 🏅Social Steps Ranking➤Ranking daily steps, compete with your friends here, walk more andoccupy your friends' cover on your pedometer. It is a free stepcounter that you can invite your friends to do exercise together.💥Customized Fitness Plan ➤Set your personal goals for duration,distance, calorie , weight or interval training. Monitor yourprogress and adjust your schedule anytime, anywhere on your stepcounter. 📈Personal Health Report ➤Tracking habits and health.Customize your reporting time every day, get your daily steps andranking reports on time automatically. Join us and get fit andactive. 🎁Smart Notification Alerts ➤You can check your process innotification bar to confirm tracking your walk process always.Track your steps and activity. Make every step count. 🎨ColorfulThemes ➤Multi colorful themes will be changed depends on time ofthe day. You can explore morning, day & night 3 different thememodes to enjoy your step counting experience with this steptracker. 💖Fashion Design ➤You will experience easy UI with MaterialDesign, and our step tracker design will be improved by users’opinions timely. 🏆Continuous Achievements System ➤Count your steps,track your activity and improve the accuracy of step counting toupgrade your level. Set goal, get achievement and level up. 🤔How toEffectively Use Step Tracker ✦ Adjust step counter sensitivity toset your own fitness plan base on your personal condition. ✦Connect to Facebook and rank with your friends here. Establishfriendly competitions through fit exercise to motivate each other.✦ You can check your real-time steps by setting a fixed banner inyour notification bar. ✦ Start, Pause and stop step counting moreeasily as you wish. Check your active time and access to the numberof steps flexibly. ✦ Do fit exercise before walking. 2 minuteswarm-up exercise helps you walk more safer. 2 minutes stretchexercise helps you burn more calorie. 👣 Pedometer-Start walkingwith step counting and activity tracking. Keep your Walking fortraining plan every day. Improve your physical fitness, strengthenheart rate and lung function, improve muscle strength throughsimple operations.This app can fit you to get active, burn yourcalorie and keep your health life.